A lawn can add that element of beauty and greenery to any home. Lawn these days are not just grass but an investment which requires time, money and also building memories. A lawn that looks beautiful and is healthy can truly add that fascinating look and healthier feeling to any home. Every lawn owner always wishes to keep their lawns maintained. So, if you too are finding ways for lawn maintenance, here are some tips that can prove useful. Portable sprinklers these days prove to be an ideal method of watering grass, which you can easily choose based on your lawn watering area. There are other types of sprinklers like portable sprinklers, stationery sprinklers, oscillating sprinklers and more available which you can choose based on the lawn type. Lawn watering should be practiced based on the season and weather conditions. Like summers always call for more and frequent watering, while winters need reduced watering requirements. Lawns require sufficient watering in order to keep away weeds. Also, try choosing plants and shrubs if you live in a region which is susceptible to drought or has low water levels. It’s recommended to plant grasses and shrubs which are drought and pest tolerant in such areas. A mower must be chosen based on the area and type of lawn. Try using a lawn-mower which has a mowing height of 2.5 to 3 inches, as its perfect for most seasons. It’s only during summers that you should increase the mowing height to 3 to 3.5 inches, which ensures increased insulation from the scorching heat and decreased water loss from the soil. Use a lawn mower that mulches which can help in cutting and re-cutting grass trimmings, ensuring quick decomposition and release of nitrogen and other nutrients into the lawn. Changing mowing direction, every time you mow your lawn can help in easily getting a flat surface. Maintaining a lawn that can add that anticipated look to your home is not an easy task. 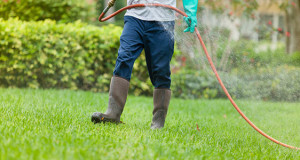 So, to begin with, you can always take professional help from Swatter Pest Solutions LLC, where the start gets easier to achieve that perfect lawn quickly.